Looking for a New Year’s Eve drink to serve a crowd? 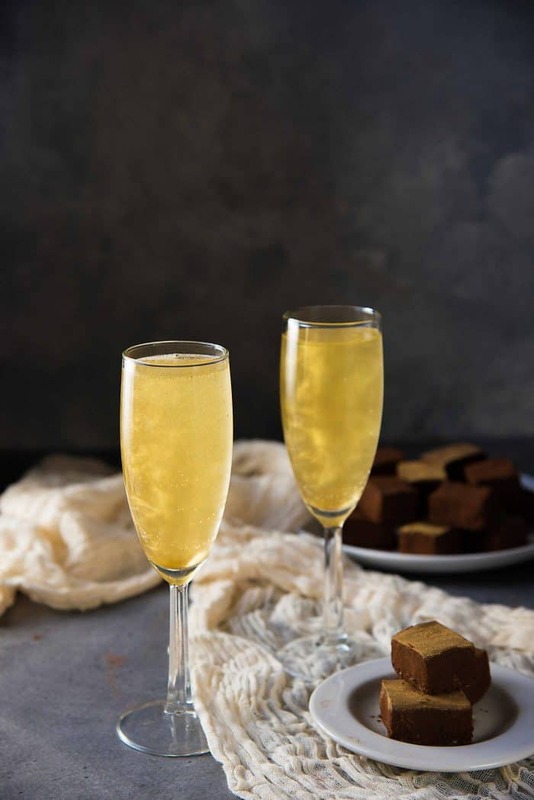 This simple yet spectacular Gold Shimmery Champagne Cocktail is all you will need! With sweet, fruity, floral elderflower champagne flavors and shimmery gold luster swirls, this cocktail is a party on its own! 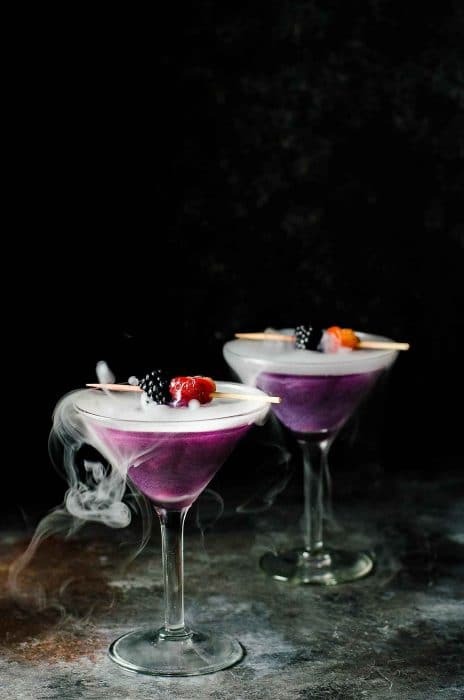 Looking for an easy but SPECTACULAR New Year’s eve drink to serve at your party? I got you covered with this easy, delicious and spectacular New Year’s eve drink – a Gold Shimmery Champagne Cocktail! This shimmery new year’s eve champagne cocktail is going be a hit at your party, and it couldn’t be simpler to make! It’s an easy elderflower champagne cocktail with the added magic of a touch of gold luster dust to make it mesmerizingly beautiful. Plus, I’ve also included in this post an option for a NON-ALCOHOLIC new year’s drink version of this too. 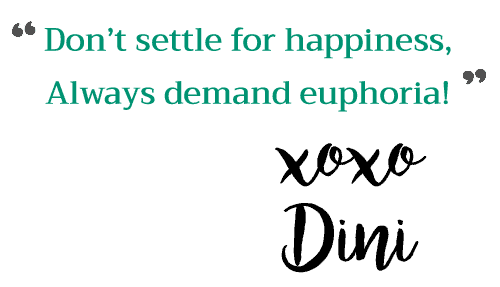 If you’ve followed my blog before, you’d know how much I love shimmery cocktails! 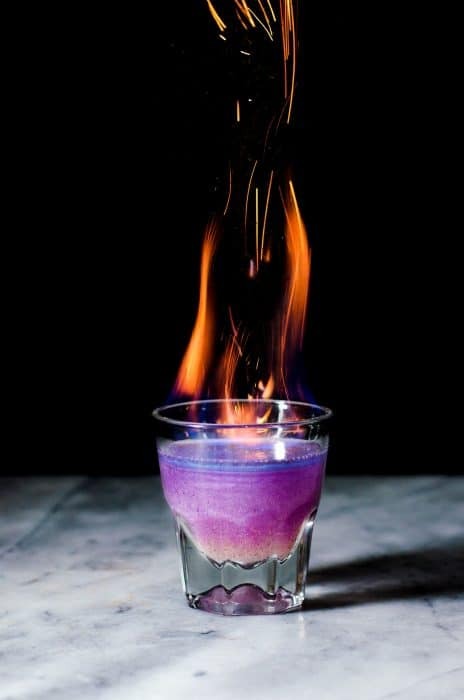 🙂 I first came up with the homemade shimmery liqueur back in 2015, and have made several shimmery cocktails using this nifty technique since then, like my rainbow colored fruit infused shimmery liqueur. You can check out The Witch’s Heart cocktail here, and the Unicorn Blood cocktail here, but my favorite so far is this color changing, shimmery phoenix cocktail (which also happens to have elderflower, mixed with gin). Simply mix St-Germain liqueur with some gold shimmery luster dust to create the GOLD SHIMMERY LIQUEUR needed for this champagne cocktail (see picture above). Pour this into champagne flutes. Then top it with your favorite bubbly, preferably a sweeter sparkling wine like extra-dry or dry champagne, prosecco or my favorite – a spumante. A brut chamapgne will work in a pinch too. 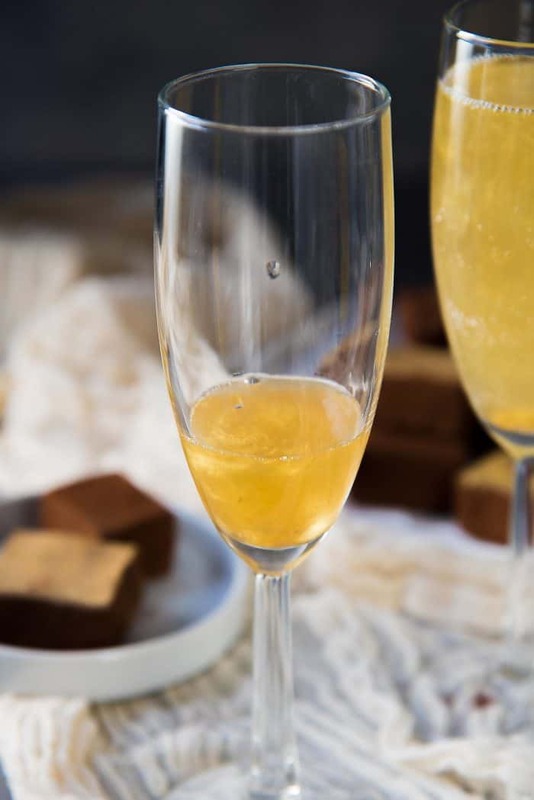 I prefer to stay away from brut-nature or extra brut champagnes since this is a sweeter cocktail, so a slightly sweeter champagne or prosecco will work better (especially one with fruity/floral notes). If you are unable to get your hands on St-Germain liqueur to make this simple shimmery new year’s eve cocktail, you can follow my cheat’s method to make your own. 1 part vodka + 1 part elderflower cordial gives you a cheat’s version of St-Germain liqueur. 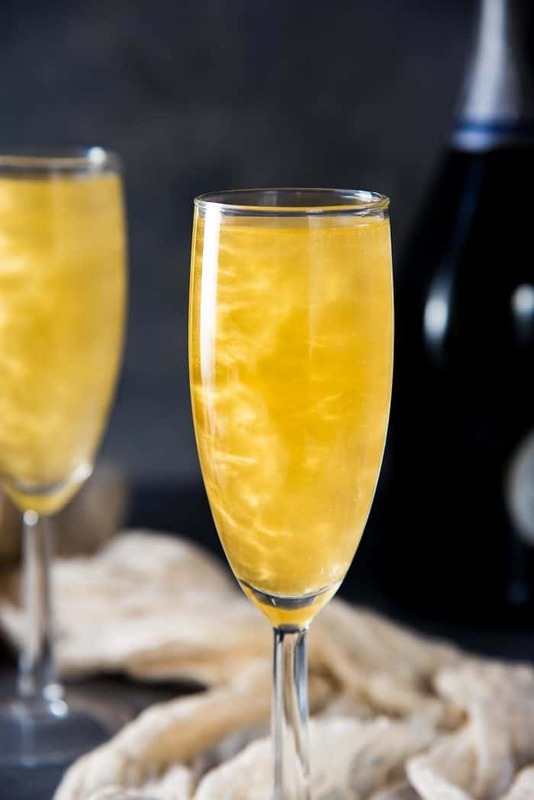 To prepare ahead of time for this gold shimmery champagne cocktail, pour a portion of the elderflower liqueur (or the homemade cheat’s St-Germain liqueur) into a bottle (roughly the amount you’ll think you need, you can always make more). Next, add enough gold luster dust to the elderflower liqueur base and mix to make it shimmer. You don’t need too much of the luster dust – up to a heaped 1/4 tsp per 8 fl ounces of the liqueur. YOU DON’T WANT TO ADD TOO MUCH SHIMMERY LUSTER DUST EITHER – only add just enough to have gorgeous shimmery swirls, and that doesn’t take too much at all. These two are my favorite gold luster dust that I like to use. A darker gold luster dust and a brighter gold luster dust. How to make Non Alcoholic New Year’s Eve drink that is kid friendly? Instead of using St-Germain liqueur, just use elderflower cordial. Instead of champagne or prosecco, use SPARKLING GRAPE JUICE OR APPLE JUICE instead. 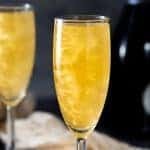 How to make this New Year’s Eve drink (champagne cocktail) for a crowd? 4.5 fl oz of the elderflower liqueur will make 6 of the shimmery elderflower champagne cocktails (about 2/3 of a cup). Each champagne/prosecco/spumante bottle holds about 25 fl oz, and you will be using about 4 fl oz for each drink. So 1 champagne bottle will serve 6 shimmery champagne cocktails as well. 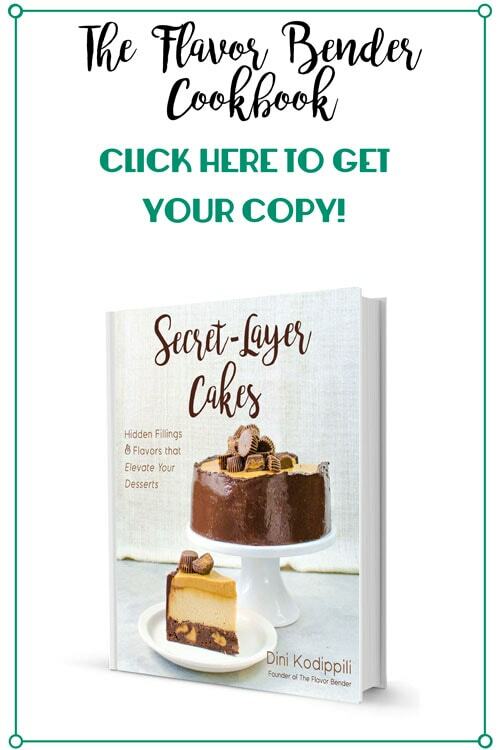 Divide the number of guests you will be inviting by 6, and multiply the recipe ingredients by that factor. (i.e. – 30 people at your party? Divide by 6, so you get 5. Multiply the recipe by a factor of 5, so you will need 45 fl oz of elderflower liqueur, about 1 1/2 tsp of gold luster dust and 5 bottles of champagne). To be honest though, this shimmery new year’s eve champagne cocktail is so simple to make, you really don’t need to prep ahead. But if you’d like to, you can divide the elderflower liqueur with the gold luster dust into each of the champagne flutes ahead of time. So when the time is right and everyone is getting ready to celebrate, pop open your bottle of bubbly and pour it into the glasses. The bubbles from the champagne will make the shimmery dust swirl and shimmer, making for one magical, shimmery New Year’s eve cocktail! The shimmer lasts for about a minute, and when it settles to the bottom, you can stir it back up to bring back the shimmer. 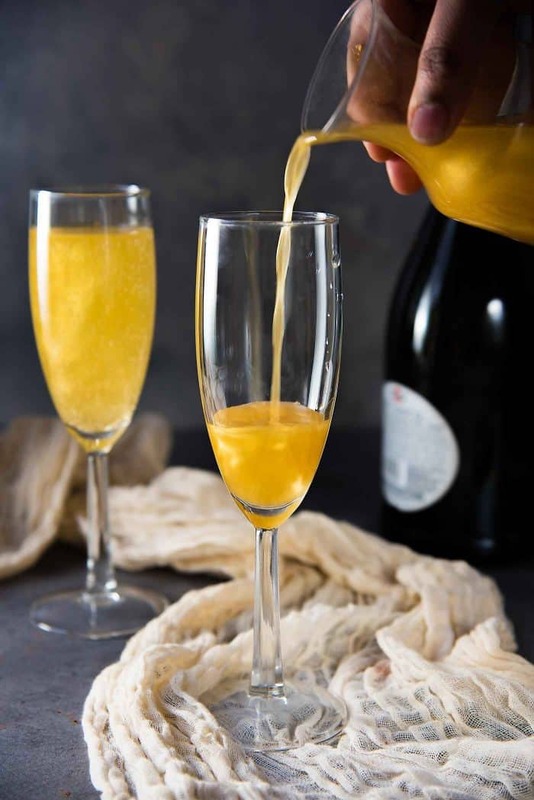 This is why I prefer to pour the champagne just before serving, so that your guests can see the beautiful shimmery swirls in this new year’s eve cocktail. This is a really easy and fun cocktail to drink with those fruity, floral, sweet flavors. It really is the perfect new year’s eve drink/celebratory cocktail! 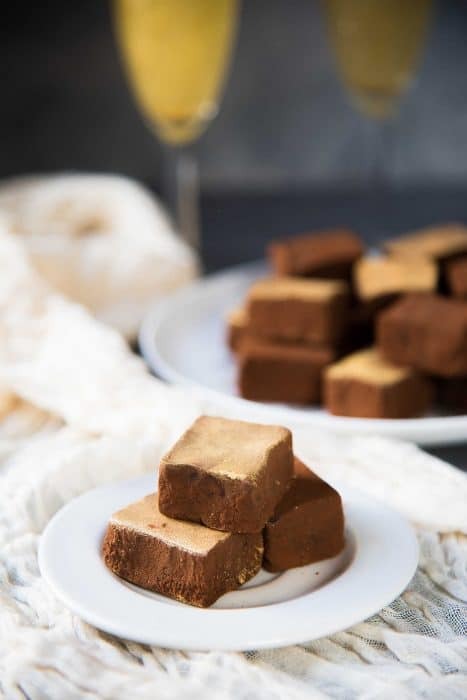 This cocktail is even better when paired with Chocolate Champagne truffles that I made using the same bubbly I used for this recipe! Plus, I added a touch of extravagance with gold luster dust to the chocolate truffles, so that the cocktail and sweets will match in taste and appearance! And as a bonus, you can change the color of the luster dust to suit your celebration/theme too! Pink or red for a Valentine’s day cocktail. Your favorite color for your birthday. 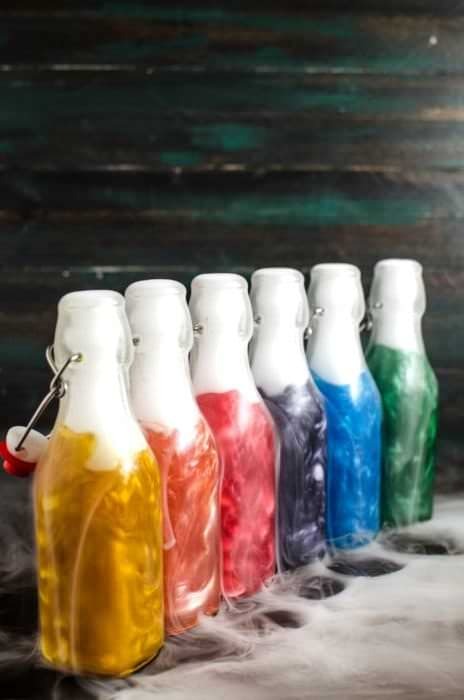 Theme colors for themed parties or weddings. The possibilities are endless for this gorgeous shimmery champagne cocktail with a touch of shimmery luster dust. Mix the St Germain liqueur with the gold luster dust until you see gold swirls/shimmer. If you cannot find St Germain liqueur, mix the vodka, elderflower cordial and gold luster dust together to create the homemade gold shimmery liqueur. Chill until needed. 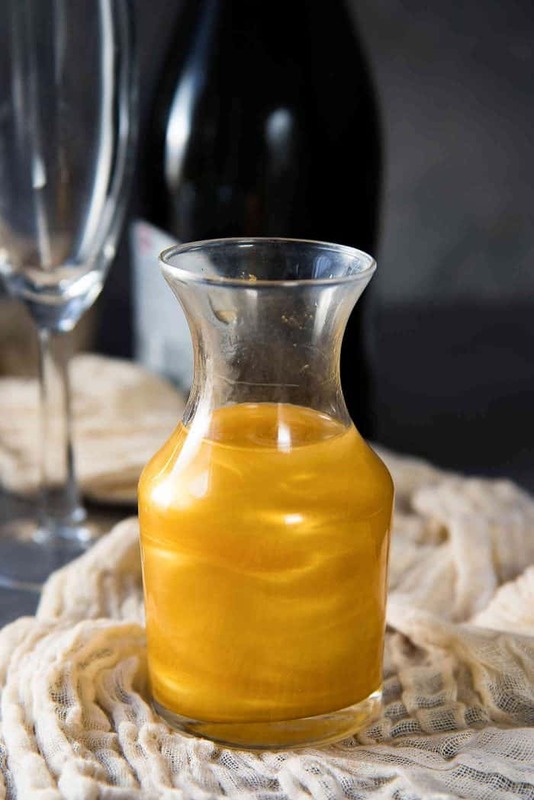 Measure ¾ of an ounce (½ jigger) of the gold shimmery liqueur into each champagne flute. Top with chilled champagne (about 4 oz) and serve. Mix the elderflower cordial and the shimmery luster dust until you have gold shimmery swirls. Chill until needed. Measure about ¾ of an ounce of the gold shimmery base into each champagne flute. Top with chilled sparkling grape juice or apple juice (about 4 oz) and serve. Notes - If the luster dust settles to the bottom, give it a quick stir and it will suspend in the drink again and create those lovely swirls. If you liked this shimmery new year’s eve drink/gold shimmery champagne cocktail (elderflower champagne cocktail) recipe, don’t forget to subscribe for new (and free) recipes by entering your email address on the side bar (and get all these recipes delivered straight to your inbox), so you don’t miss out on a thing. You can find me on FACEBOOK, TWITTER,INSTAGRAM, PINTEREST, YOU TUBE and GOOGLE-PLUS too. This is just impossibly gorgeous! Love it!!! 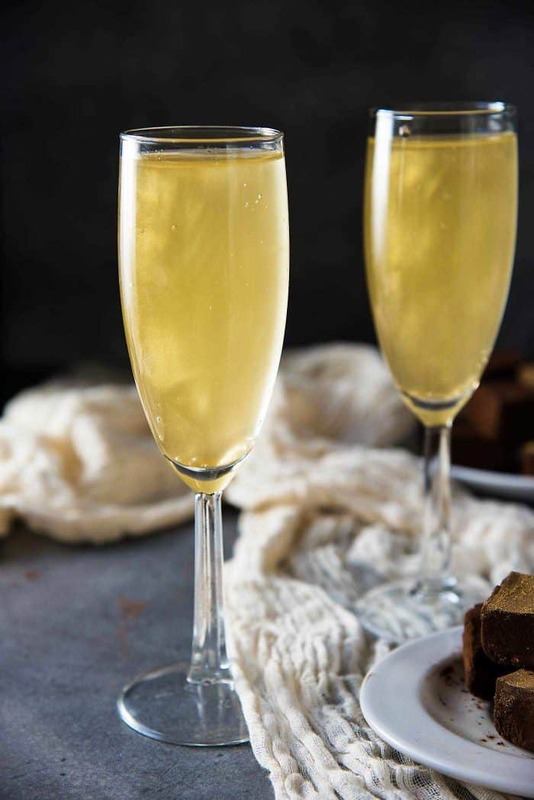 This champagne cocktail is so perfect to ring in the new year! 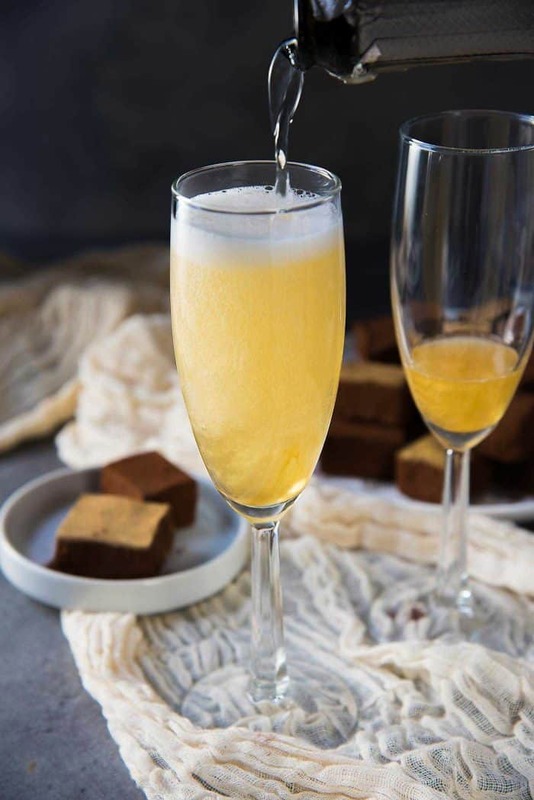 That gold shimmer really adds to the celebration and creates a gorgeous drink! So pretty and incredibly easy!! I love St. Germaine and have a bottle in my cupboard. I think that I need to grad some luster dust for NYE. Beautiful! I know we have the St-Germain liqueur ! This cocktail not only looks refreshing but it is absolutely perfect for New Year’s Eve !